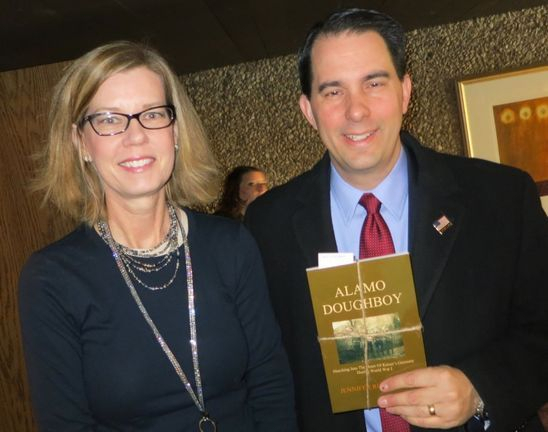 "Alamo Doughboy, a truly noteworthy work that should not be missed or wind up overshadowed." "The author lays out a captivating story starting with life on the farm in Minnesota where the Knott family had its roots. I was pleasantly surprised to find that the family was not of the silk stocking variety as is so often the case in personal experiences in the Great War." "I was again surprised when I didn't find the usual patriotic flare of voluntarily enlisting as soon as the war was declared. Instead, all three brothers duly registered for the draft in June 1917 and waited their turn." "The narration is like talking to a friend over a steaming cup of coffee on a cold winter night." "This work needs to survive the flood of centennial releases." A very enjoyable read. Jennifer Klett has a knack to capture the reader's attention with an easy reading style that takes you into the 360th regiment trench warfare of WW1 through the letters of Judge Knott, her grandfather. Not only does she meticulously describe the raw facts with factual data, she leaves you haunting images that seem to linger. I was transported to 1918 to a different time when soldiers endured under extreme conditions. This book made me cry. To read this book is to immerse yourself in the experiences and mindset of American Boys who fought in the Great War and their families. With numerous letters from the soldiers it takes the reader to the harrowing psychology that must have been life on the Western Front. The letters are not completely unlike what one might expect from comparable circumstances in current times, and yet they are somehow different. At times their upbeat tone is remarkable. While chronicling their experiences, the book also conveys themes about how the US was then a much less urbanized country, how German Americans dealt with the tension of being at war with their ancestral country, and how a Lutheran - Methodist wedding could constitute a controversial mixed marriage. In the big picture, Alamo Doughboy reminds us that WWI thrust the US onto the stage of global conflict, and that the tensions over which it was fought were not really ameliorated until 1945 in Western Europe and persist with us to this day in the long aftermath of the Bolshevik Revolution in Russia. I appreciated this book as it told the story of a family's gift of service of five sons for its country, without reservation, and their return to rural Minnesota after. I especially enjoyed the discussion regarding the techniques for communication in wartime in 1918, and the risks that "runners" took to pass on pertinent information to the troops. The author wove together lots of family records, knowledge, and stories into a coherent account of the family experience in World War I. Well done. The author has done a remarkable job of combining the experiences of her family members during WWI along with a detailed history of the U.S. military's role. We see one family in a small Minnesota village contribute five of their sons to a world much larger than the one they had known, and then follow them back home again as they resume their pre-war peaceful lives; however, the reader knows that these men have seen the carnages of war yet are proud of having been part of this major world event. I enjoyed this book immensely. There is a lost history, a personal history of WWI. We understand the movements of troops and readily conceptualize the physical challenges of trench warfare yet miss much of the lives, thoughts and fears of the people who were fighting. Our veterans have passed and with them the personal accounts of their lives. This books is not just an account of war and valor, it is an in-depth diary of a literate soldier, a young man with a life and a family that exists before and after the conflict in Europe. The thoughtfully intertwined historical background filled many voids in my knowledge and understanding of this conflict and the personalities involved. Really, really well done. Among the many things I found extremely moving: the letter that Ray sent home, describing his journey. It was so touching. Or, when Judge walked past the dead German soldier and "matter-of-factly" introduced himself, followed by the others, in a single file, doing the same. Also, the story of Duke going to the train station every day was really heartbreaking. I could go on . . .
You walked your grandfather's life with him. There is no greater tribune. I am so very thankful your wise aunt shared her box of treasures with you so that the story could be told. You have helped millions of veterans and families who sent their loved ones into battle for us. The research you did is beyond my imagination. Again, thank you. I heard you speak at Highlands at the Lake, and enjoyed it very much. I bought your book, and just finished it, and have to tell you that it is a very impressive work. You took us through a large amount of facts and information, but didn't lose us on the way! The letters from your grandfather were so helpful--to hear what was happening from his point of view. Your grandfather's sense of humor came through in the stories you chose to tell. And his faith, which I too think helped him survive. As for the Germans praying, of course they did. You only have to read Bonhoeffer to see the internal struggle many Germans went through in WW II . . . The story of Carlton Knott is probably the most touching . . . I will look forward to seeing the statue on the Mall for WW I fighters, and in reading your next book! The First World War dramatically altered nearly everything in the world, yet we as Americans know next to nothing about it. Hopefully, this book will help change that. This true story follows the path of a young man named Judge Knott, along with his two brothers and two cousins, all of whom grew up in the same small town in Minnesota. This detailed account is told through family interviews, US Army regiment and division histories, service records, newspaper articles, and letters from over there. I found it simply amazing to be able to pinpoint one man’s steps in the chaos of war nearly one hundred years later by the week, day and even the hour, when writing this book, especially since Judge’s federal service record was a casualty of the infamous 1973 fire at the National Personnel Records Center in Missouri. I found his story fascinating. There has been comparatively little written about the United States in World War I, especially from the perspective of a neglected private in the trenches. Just traveling overseas was a monumental adventure for most at that time. What did going over the top mean to infantrymen? What was it like being a runner? What about influenza and disease? Trench warfare? Aviation combat? Chemical warfare? Who were the Texas Brigade? Who were the Lost Battalion? What happened on November 11, 1918? How did the war affect the entire family? The hometowns? How did soldiers cope once back home if they were lucky enough to survive the brutal physical and emotional trauma of war? The historical significance of the First World War cannot be overstated. It reshaped the entire twentieth century. Its ramifications are still being felt. The rise of communism and its subsequent regimes and wars (Korea, Vietnam); World War II (some historians consider it a continuation of World War I) and its holocaust (the first modern day genocide inflicted on the Armenians occurred in the First World War with the world casting a blind eye to it); the Cold War; and Middle East conflicts . . . all have roots in the Great War. It’s been nearly one hundred years since the war began. Today, the indescribable carnage, historical importance, and modern-day consequences of World War I are sadly glossed over in school classrooms and virtually ignored by media. American public libraries can easily have ten times the books about World War II over World War I on the nonfiction history shelves. And that doesn’t even include biographies, movies, documentaries, etc. How can we begin to understand current ethnic, religious, and geo-political conflicts without possessing knowledge about the years 1914 to 1918? We still commemorate Veterans Day, but what do we know about its predecessor Armistice Day? We’ve all seen the iconic twentieth-century war memorials in Washington DC, possibly experiencing them in person. World War II, Korean War, Vietnam War. They help us reflect, learn, and honor the sacrifices. Do you remember the national World War I memorial? No, because it doesn’t exist. It has been disregarded in this country, along with much of the war itself. Fortunately, steps are underway to correct that shameful absence (please visit www.wwimemorial.org). The stories of the First World War must not be forgotten. For many years, George “Judge” Knott was just my grandfather. No real story there, or so I thought. Then in 2005, an aunt gave me his war letters, lovingly cherished and handed down from her aunts. Suddenly, my grandfather was not just an old man anymore. We’ve met the so-called greatest generation, now let’s meet the generation that raised them. I invite you to look up your own grandfather or great-grandfather. It’s as easy as going to your local library, which may have free online genealogical databases. You may be surprised. While they may not call attention to themselves, the quiet accounts of history may still be present. The doughboys are all gone now. There can be no honor flights. It’s too late to thank them. But, we can remember them. The Great War changed Judge’s life, and it changed the world. Read on and meet Judge the doughboy. He was there and this is his story.